DrinkOrder is coming! DrinkOrder is coming! Hi guys! We are very excited to announce a new side project called DrinkOrder! 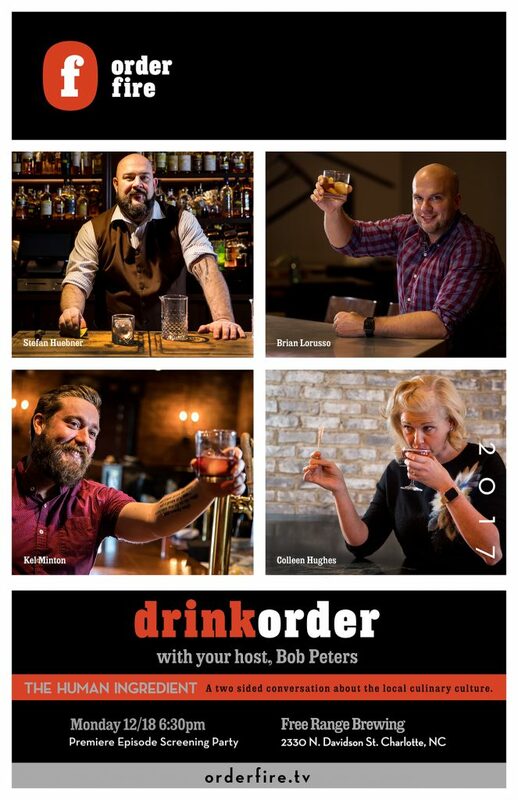 DrinkOrder features host Bob Peters, the famed bartender and Head Mixologist of The Ritz-Carlton, Charlotte. Bob will be speaking with the South’s bartenders and sharing their stories and cocktails with you! Our kick off event is going to be awesome! We will be featuring 4 of Charlott’e’s favorite bartenders, Kel Minton of Soul Gastrolounge, Colleen Hughes of Haberdish, Stefan Huebner of Dot Dot Dot, and Brian Lorusso of Dogwood Southern Table and Bar at a special Monday evening screening at Free Range Brewing at 630pm. You will be able to meet each of the bartenders as they serve up samples of their special libations and to enter a raffle to benefit Hospitality House.